Tag line: "The Saw is Family"
In the opening scene of Leatherface: The Texas Chainsaw Massacre 3, we witness the bludgeoning of a young girl by Leatherface (played by R.A. Mihailoff), then watch as he meticulously constructs a new “flesh mask” from her remains. 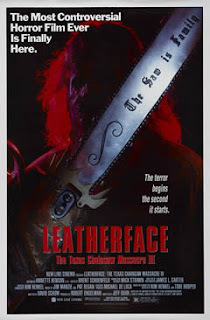 It's a disturbing opening, but also one that marks a step in the right direction for the Texas Chainsaw franchise; after the comedic bent of Texas Chainsaw Massacre 2, Leatherface set out to get the series back on the grisly path laid out by the original over 15 years earlier. Fortunately for us fans of the series, it was able to do just that. Ryan (William Butler) and Michelle (Kate Hodge) are a pair of college students driving cross-country from California to Florida. While traveling through Texas, they're diverted by the State Police (who are investigating the discovery of a mass grave), and end up at a small roadside gas station. What they don't realize is the station is owned by Alfredo (Tom Everett), a member of the cannibalistic Sawyer family wanted for a string of murders committed throughout the State. Hoping to find a quick route out of Texas, the two instead end up as the Sawyer's prisoners, and at the mercy of the demented Leatherface. The “mad and macabre” feeling of the original Texas Chainsaw Massacre is alive and well in Leatherface; in an early scene, we watch as a pair of police officers are pulling body parts from a swampy mass grave, estimated to hold the remains of as many as 40 people. The apprehension and dread that builds in this scene carries through the entire film. The 'new' Sawyer family (only Leatherface, played well by Mihailoff, and Grandpa, now a lifeless corpse, return) is a colorful bunch of characters. Viggo Mortensen is “Tex” Sawyer, a seemingly quiet guy whose true nature eventually makes its way to the surface. This was an early role for Mortensen, who would go on to super-stardom in Peter Jackson's Lord of the Rings trilogy, and he is excellent in the part. Tinker (Joe Unger) is the obvious head of the family, yet he doesn't really have any authority (in one memorable scene, he tries to “discipline” Leatherface, only to have his hand nearly burned off). This particular branch of the Sawyers also boasts a little more diversity than any of the previous films: though confined to a wheelchair, Mama Sawyer (Miriam Byrd-Nethary) is not someone you want to cross, and even young Jennifer Banko, who is supposedly playing Leatherface's daughter, gets in on the “fun” by stabbing Michelle in the leg with a knife (one she keeps hidden inside a skeletal “doll”). Yet while the family may believe they're the ones in control, the supposed “victims” of Leatherface are anything but meek. Horror icon Ken Foree (Dawn of the Dead) makes an appearance as Benny, a survivalist who ends up stranded in Sawyer territory. Armed with an automatic rifle and a strong desire to survive, Benny proves a formidable opponent for the Sawyers. Even Michelle, the film's leading lady played by Kate Hodge, isn't your run-of-the-mill victim; when she finally does escape, instead of just running off, she goes after Leatherface, leading to a dramatic showdown between the two in the swamps. With strong characters on both sides of the fence, and a definite return to the grim and gruesome ways of the original, Leatherface: The Texas Chainsaw Massacre 3 is every bit the film that I wanted Part 2 to be. oh boy doctor shock, it looks like you will be covering the whole series of texas chainsaw, this is a pleasant surprise and follow up to the excellent bonus episode provided by the podcast. i will be staying informed by visiting your blog to get all of the reviews of the whole series. Not sure when I'll be posting the next Texas Chainsaw film (especially since the next in the series, #4, was abysmal...gotta work my way up to that one! ), but I do appreciate your visiting the blog. Thanks so much, and thanks also for listening to Planet Macabre. Is this the one where leather face gets a long, new chainsaw? Also on a previous comment you mentioned recordings are done on thurs day if that is true is the puppet episode coming our way another gem? Yes, in this film, Leatherface is presented with a shiny new chainsaw, with the inscription THE SAW IS FAMILY etched into the blade. And you sure won't want to miss the next episode! It's been recorded, and offers some frank (even heated) discussion about 5 doll/puppet horror films. Should be a good one! Howdy-de-doo pod-doc, the bonus episode was purely fabulous, i had a great time listening and sinking in all of the information. The disc is in the mail and i should hopefully have saturday for my weekend viewing. Thank you for providing a great blog here and your podcasting brothers-sister on planet macabre. @Vinnie: Howdy-de-doo to you too! I'm glad you enjoyed the recent bonus episode of Planet Macabre. I'm confident you'll like the film, but be sure to stop back and let me know what you thought of it! Thanks for the kind words about the blog. I do appreciate them. Thanks also for listening to Planet Macabre.